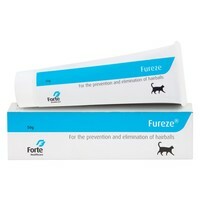 Fureze is a palatable, vegetable oil based oral paste to aid in the elimination and prevention of hairballs in cats. Designed to envelope hairballs in a very lubricant layer of slime, Fureze will ease the passage of hairballs either via regurgitation or in the faeces. It has also been shown to help prevent hairball formation when given regularly, by stopping single hairs from merging. Fureze is well tolerated by cats of various breeds and all ages, and can be administered with food, given alone or smeared onto the paw.